One of the biggest rock/metal bands from the 80’s & 90’s returned to Madison for this year’s 2017 Brat Fest. Queensrÿche, which had success with releases Operation Mindcrime (1988, certified Platinum) and Empire (1990, triple Platinum) came to Madison in support of their 2015 release Condition Hüman (US Billboard #27). I had a chance to catch up with the band and guitarist Parker Lundgren who hails from the same small town in the Pacific Northwest as I do. 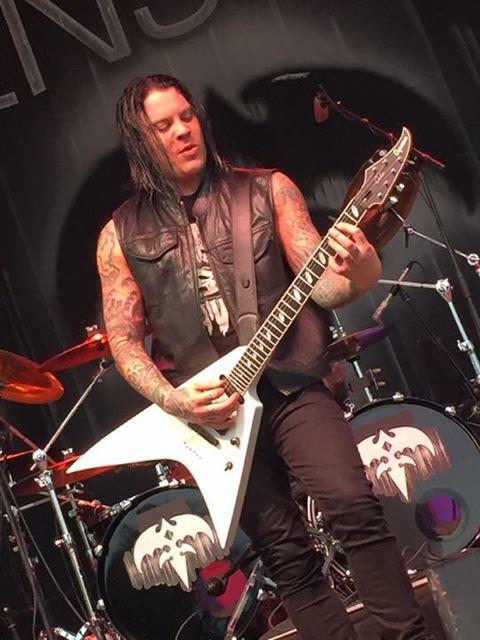 Parker Lundgren, lead/rhythm guitars and backing vocals, shared some of his thoughts on Madison, Queensrÿche and supporting fellow small town musicians. Maximum Ink: Queensrÿche has a long and rich history with Wisconsin and specifically Madison, including the recording of the live release Operation: LIVEcrime (1991 double Platinum). How hasa the reception been this year? Parker Lundgren: We love coming to Madison and Milwaukee. I love to ride, and Wisconsin has Harley Davidson. I’m a huge fan of bikes and have a sweet bike as well. The energy from the fans at shows is great and we can feel the magic of a live show like what we had here [at Brat Fest 2017]. MI: With the addition of lead singer Todd La Torre, (2012), Queensrÿche has returned to the classic “Rÿche” heavier sound on this new album Condition Hüman. How has that helped you and your song writing for the band? PL: Todd lives in Florida, and I have a recording studio back home. So, when I write a song, I visualize Todd singing the song and how he would sing it. We all love the early Queensrÿche albums. We haven’t even thought about how we write, it’s just that early style that we all love. Todd has this crazy gift where he can emulate voices. When we are messing around at sound checks before a show, Todd will imitate other singers or accents. It’s hilarious. PL: We all bring songs to the table, then we collectively work on each other’s songs and try to form them and their arrangements. The song “Bulletproof” is pretty much how I wrote it and how it appears on the record. I also wrote riffs and solos on other songs on Condition Hüman too. MI: Was there any hazing or initiation rituals you had to go through from fellow Queensrÿche members when you joined the band in 2009? PL: No, the band didn’t, but the fans sure did. Fans would say that they have been listening to this band before I was born. It took them a long time to accept me, until I wrote the song “Where Dreams Go To Die” in 2013. That was a re-birth of the band and the band asked me to stay after Geoff (Tate) left. MI: You and I come from the same small town in Washington State (Port Townsend), with less than 140 people in your graduating class, what advice do you have for kids from a small town here in Wisconsin about being a successful musician? PL: It’s easier when you are younger, even though you have school, you don’t have a job, and you have a little down time to work on your craft. I’ve taught at music schools before, and I think kids learn things better than adults, especially if it’s something they are into. The best thing to do when you are young is to start a band and play with other people; it really teaches you a lot. I started a band as soon as I got a guitar. We were awful, obviously. We started playing shows right away and we learned together. MI: So, what were some of your influences as a kid? PL: There is a blues/jazz & folk festival every year where you and I grew up. People come from all over the world to learn from other musicians. They stay a week or two with long and intense classes. I got to go every year and learn from some of the best musicians in the world. The theory and scales of jazz & blues is way more intense and more difficult that what you might think. MI: There is talk about a new Queensrÿche release in 2018. Are you guys heading into the studio after this tour is over? PL: Ya, we have about 20 songs so far and still need to do some work, but we look forward to putting something together after our tour. MI: With all your jazz & blues training, does that mean that we might hear a little jazz or blues sound on the next Queensrÿche release? PL: No. If it’s not broke, don’t fix it. We stick to what we do best.